This ain't no squirrel huntin' soap. 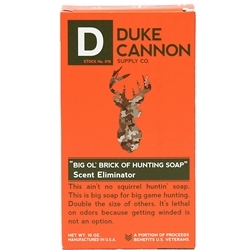 This is big soap for big game hunting. At a hefty 10 oz., it's double the size of other hunting soaps, and it's made with a unique formula that captures odors, smothers them, and prevents their release. It's like a Special Forces combat mission against your scent. After all, true hunters know that getting winded is not an option. A Portion of Proceeds benefits US Veterans.